The built-in worksheets in Telemetry Dashboard display lots of useful data, but sometimes you want more control over how the data is displayed. To do this, you can use the custom reporting feature in Telemetry Dashboard. 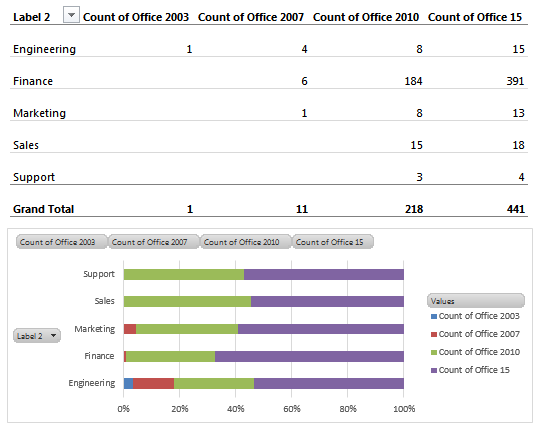 This feature uses PivotTable reports to help give you a deeper view into how Office is being used in your organization. In this article, you can learn how to create custom reports, and you can find information about the telemetry database tables and fields that are used in custom reports. The built-in worksheets in Telemetry Dashboard show you a relevant subset of the data that is collected by Telemetry Agents. However, the built-in worksheets aren't customizable, and you might want to see a combined view of data that appears on different worksheets. This is where custom reporting can help you use PivotTable reports to view telemetry data in meaningful ways. For example, the following screen shot shows a custom report that lists the unregistered ActiveX controls that are detected on monitored clients. You can see that we've added fields to display the solution name, user name, and business group (as configured for Label 2 when the agents were deployed). This report helps us identify the solutions that use unregistered ActiveX controls and who is using them. In contrast, the Documents worksheet lists these solutions but doesn't have a column to indicate whether unregistered ActiveX controls are detected. You have to view the Document sessions worksheet for each document to see whether ActiveX controls are being used. To use labels in custom reports, you have to configure them when you deploy Telemetry Agents. If you haven't already done this, we recommend that you carefully plan labels that support the types of custom reporting that you'll do. For example, setting labels to identify business groups, locations, and job roles can help you find trends and issues for specific groups or types of users. Enabling and configuring the telemetry agent will help you configure labels (known as tags in the Group Policy settings and registry settings for Telemetry Agent). As another example, the following screen shot shows the list of Office client computers as displayed in the Deployments worksheet. This shows a high-level summary of Office deployments. But it doesn't give you a breakdown of how Office is deployed across business groups. You can get a more detailed view of Office clients by using a custom report. In the following illustration, the Office clients are grouped by business groups (as configured for Label 2) so that you can see the breakdown of Office deployments across each group. You can also create a PivotChart to help show the data. This custom report uses a hidden table, System_details, that you have to manually add before you can add Office versions to your report. You can learn how to do this in Hidden tables in Telemetry Dashboard custom reports. You can create a single custom report on the Custom report worksheet. This automatically loads the default tables and creates a basic custom report that you can use as a starting point. Then, you can add and remove fields to design a report that meets your business needs. For performance reasons, not all tables are loaded automatically when you create a custom report. You can add tables by using the procedure in Hidden tables in Telemetry Dashboard custom reports. The most common reason to add hidden tables is to gain access to Office builds, which are available in the System_details table. In this video demo, you can see custom reporting in action. We compare data that is shown in the Solutions worksheet to similar data that is shown in a custom report. This video will also help you learn how to add and move fields in a PivotTable report. Use the 64-bit version of Excel, which doesn't have the 2-GB memory limitation, but does have other drawbacks. See Choose between the 64-bit or 32-bit version of Office to learn more. Adjust the reporting threshold in the telemetry database to change how much data is pulled into PowerPivot when custom reports are created, You can learn more about this setting in How to configure privacy and performance settings in Telemetry Dashboard. To create a custom report, you have to first start Telemetry Dashboard. The following table describes how to start the dashboard in different versions of Windows. From the Start menu, choose All Programs, then Microsoft Office 2016 Tools, then Telemetry Dashboard for Office 2016. On the Start screen, type Telemetry Dashboard, and then choose it from the search results. Swipe in from the right edge to show the charm bar, and then choose Search to see all the apps that are installed on the computer. Next, choose Telemetry Dashboard for Office 2016. In Telemetry Dashboard, on the Getting Started worksheet, choose Connect to Database. In the Data connection settings dialog box, type the names of the computer running SQL Server and the SQL database that you specified when you installed Telemetry Processor. In the navigation pane, choose Custom report. On the Custom report worksheet, choose Create custom report. To help you get started, the following tables provide procedures for creating different kinds of custom reports. From the Lookup_solutions table, drag Solution name to the FILTERS well. After the Solution name field is added to the custom report, use the filter button (next to the Solution name) to choose the solution. From the Inventory table, drag Solution version to the ROWS well. From the Lookup_issue_definitions table, drag Severity to the FILTERS well. After the Severity field is added to the custom report, use the filter button (next to Severity) to choose Warning. From the Lookup_solutions table, drag Application to the FILTERS well, and then adjust the filter to select Excel. From the Lookup_solutions table, drag File name to the ROWS well. The following tables describe the six tables and their related fields that are shown by default in the PivotTable Fields list when you create custom reports. Contains issue events for the past three months. Contains unique instance data, such as load time and solution version, about the Office documents and solutions that are monitored. Contains information about the computers that are monitored. This includes computer name, domain, hardware information, and Windows version. Contains information about the issues that were detected, such as issue type, issue title, severity, and explanation. Contains information about solutions that were detected, such as solution type, name, and publisher. Contains information about the users who use monitored client computers, such as their user name, domain, and label settings. The following table lists the fields in the Events table. Connects to the Lookup_issue_definitions table. Connects to the Inventory table. Connects to the Lookup_solutions table. Connects to the Lookup_users table. Connects to the Lookup_computers table. Shows the date and time of the event. Shows the version of the Office application that triggered the event. The following table lists the fields in the Inventory table. Shows the friendly name of the solution. Shows the file location of the file. Shows the load time of the solution in seconds. Shows the title of the document. Shows the author of the document. Shows the file size in bytes. Shows 1 if the document has VBA. Shows 1 if the document has OLE objects. Shows 1 if the document has an external data connection. Shows 1 if the document has an ActiveX control. Shows 1 if the document has an assembly reference. Shows 1 if the document has an XML schema. Shows 1 if the document has an XML expansion pack. Shows the last date and time that the solution was loaded. Shows the last date and time that the computer was scanned by the agent. The following table shows the fields in the Lookup_computers table. Shows the domain name that is registered for this computer. Shows the Telemetry Agent version that uploads the data to the telemetry database. Shows the processor name of the computer. Shows the number of logical processors in the computer. Shows the number of physical processors in the computer. Shows the architecture type (32-bit or 64-bit) of the computer. Shows amount of memory (in megabytes) that is installed in this computer. Shows this computer's screen resolution (for example, 1280 x 780). Shows the screen resolution width. Shows the screen resolution height. Shows the Windows version of the computer. Shows Windows version in detail. Shows the system locale setting for Windows. Shows system display language for Windows. Shows the Internet Explorer version. Shows the Internet Explorer version in detail. The following table shows the fields in the Lookup_solutions table. Shows the solution or document type. Shows the application that used this solution or document. Shows the solution or document file name. Shows the solution or document publisher name. The following table shows the fields in the Lookup_users table. Shows the domain name for this user. Shows the Label 1 setting. Shows the Label 2 setting. Shows the Label 3 setting. Shows the Label 4 setting. The following table shows the fields in the Lookup_issue_definitions table. Shows the severity of issue. Shows the URL where you can get more information. Not all tables are loaded when you create a custom report. If you want to access additional data for your custom report, you can load the Usage_summary, Issue_summary, and System_details tables. Follow these steps to add these hidden tables to Telemetry Dashboard. Follow the steps in Create custom reports in Telemetry Dashboard to start Telemetry Dashboard, connect to the database, and create a custom report. After you create the custom report, select any area in the custom report. This makes the ANALYZE tab available on the ribbon. On the ANALYZE tab (under PIVOTTABLE TOOLS) on the ribbon, in the Data group, select Change Data Source, and then select Connection Properties. In the Workbook Connections for Custom report dialog box, select Telemetry Dashboard - Custom report, select Properties, and then select the Definition tab. In the Command text box, add the following additional text (do not delete or overwrite the existing text): ,"Usage_summary", "Issue_summary", "System_details"
Choose OK, and on each dialog box, select Close. In the PivotTable Fields list, Choose ALL, and then scroll down to see the newly added tables for Usage_summary, Issue_summary, and System_details. Right-click each new table, and choose Show in Active Tab. 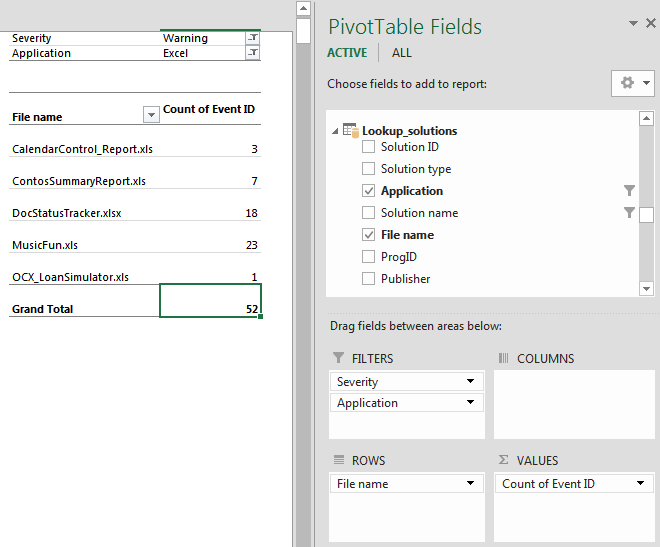 The new tables are added to the Active list under PivotTable Fields in the right column for easier access. The following tables list the hidden tables that you have to manually add to Telemetry Dashboard and describe the fields in the hidden tables. Shows user and computer information. The following table describes the fields in the Usage_summary table. 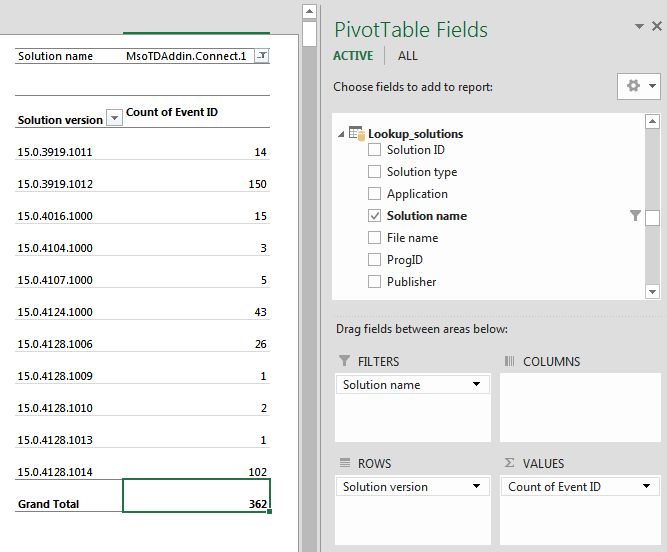 Connects to the Inventory table to gain access to more details in the PivotTable report. Connects to the Lookup_solutions table to obtain more details in PivotTable report if there is no relationship between the Inventory and Lookup_solutions tables. Connects to the Lookup_users table to obtain more details in the PivotTable report if there is no relationship between the Inventory and Lookup_users tables. Connects to the Lookup_computers table to obtain more details in PivotTable report if there is no relationship between the Inventory and Lookup_computers tables. Shows the total number of sessions in the last seven days. Shows the total number of sessions in the last one month. Shows the total number of sessions in the last three months. Shows the total number of sessions that had an issue in last the seven days. Shows the total number of sessions that had an issue in the last one month. Shows the total number of sessions that had an issue in the last three months. The following table describes the fields in the Issue_summary table. Connects to the Lookup_issue_definitions table to obtain more details in the PivotTable report. Connects to the Inventory table to obtain more details in the PivotTable report. Connects to the Lookup_solutions table to obtain more details in the PivotTable report if there is no relationship between the Inventory and Lookup_solutions tables. Connects to the Lookup_computers table to obtain more details in the PivotTable report if there is no relationship between the Inventory and Lookup_computers tables. Shows the number of issue events in the last seven days. Shows the number of issue events in the last one month. Shows the number of issue events in the last three months. The following table describes the fields in the System_details table. Shows the version of Telemetry Agent that collected this data. Shows the file share for the Telemetry Processor that uploaded data to the telemetry database. Shows the computer name for the Telemetry Processor that uploaded data to the telemetry database. Shows the system type of the computer. Shows the system display language setting for Windows. Shows the Windows system local setting (user setting). Shows the Windows system display language (user setting). Shows the Telemetry Agent scanned date/time. Shows Office 2003 version details, if it is installed. Shows Office 2007 version details, if it is installed. Shows Office 2010 version details, if it is installed. Shows Office 2013 version details, if it is installed. Shows Office 365 ProPlus, Office 2019, or Office 2016 version details, if it is installed. The following illustrations show the relationships between tables in the telemetry database.